I am one of those people who plan their travel at the last moment. So, more often than not, I end up getting a waitlist ticket in trains. Hence, I generally book tickets in multiple trains to increase the probability of getting a confirm ticket in at least one of the trains. But there are several trains to the same destination and I can’t go around booking ticket in every single train! It’s during times like these that I wish for a tool that could predict the chances of getting a confirm ticket in a train so that I can take an informed decision. Two friends, Sripad Vaidya and Dinesh Kumar Kotha, who faced similar problems while traveling, decided to do something about it. After analyzing huge data of almost 2,500 trains and deriving logic out of it, they launched a website- ConfirmTkt, in July 2014 to predict the chances of confirmation of a waitlisted ticket. So far ConfirmTkt has been able to predict results with an accuracy of 88%. The algorithm is designed in such a way that it learns while predicting. So, the accuracy should go higher with time. Do you know how to file TDR to get refund from Indian Railways? PNR Search: Enter the PNR number in the search box on the website and click on “Get Status”. The result page will show the current status of the ticket as well as the chances of the ticket getting confirmed. You can also enter your e-mail id to get confirmation notification. 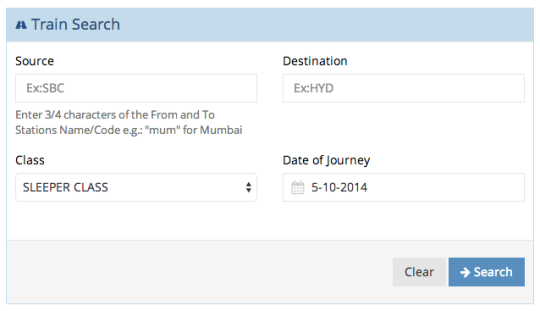 Train Search: Enter the to and fro destinations and select the class of travel and date, and hit “Search”. A neat list of available trains, current availability and chances of getting a confirmed ticket are clearly displayed. What do you think of this website? 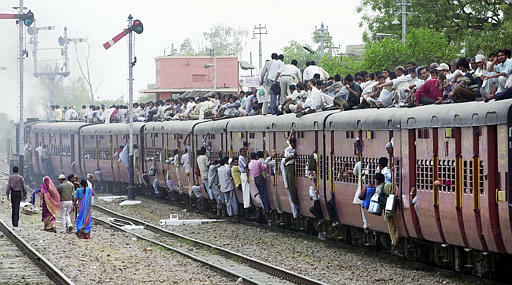 Give it a try next time when you are booking a train ticket :-).